Asphalt Roof Repair - Leaky Roof Dr.
Flat roofs, asphalt roofs and modified roof surfaces are usually ‘burned out’ within 15 years. 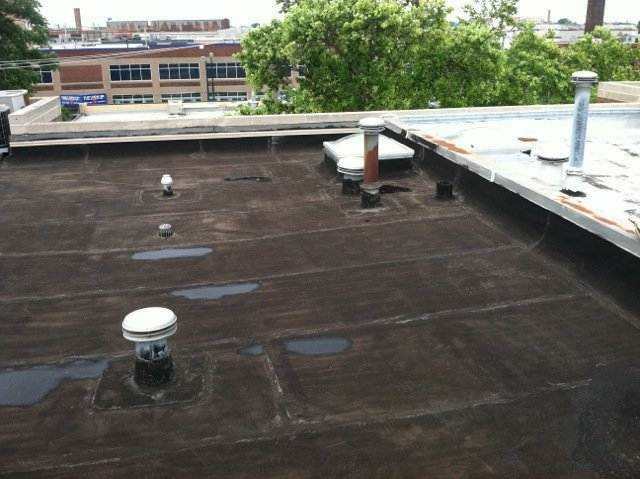 Often, these roofs develop leaks around skylight frames, vents, air conditioning ducts, drainage systems, roof equipment bases, perimeters, pipes and at abrupt surface elevation changes. After cleaning your existing roof surface, we waterproof and reinforce the above described super high stress areas of your roof (with stretchy polyester cloth embedded into super high grade acrylic fluid applied waterproofing). Then, we apply this same system across your entire roof surface. In other words, all the extremely vulnerable areas of your roof receive double reinforcing and waterproofing, and the same exact system is applied across the rest of your roof. 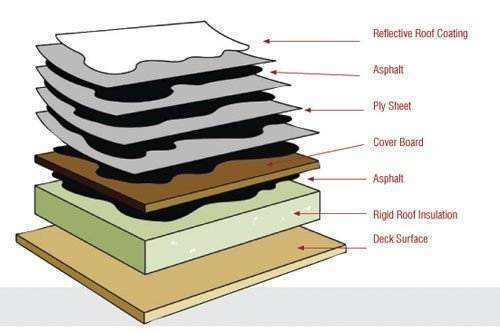 Even though the manufacturer doesn’t specify the high stressed areas to be double layered, we apply our applictions like this to doubly insure that your roof stays watertight for long term, even in the most challenging climates and conditions. We also waterproof everything else on your roof too, such as flashing seams, air conditioning duct joints, metal skylight frames, etc. That way, if there is any roof leak issue at all, when we’re finished, it’s our issue to fix immediately. We are totally responsible for your entire roof being waterproof long term! This application gives you a 15 year waterproof warranty, when top coated with a high grade acrylic finish coating, and a 25 year waterproof warranty, when we apply the higher grade silicone finish coating to your roof. To renew your warranty, we simply clean your roof and apply another top coat, so this is the last roof your commercial building will ever need! This type of application is tested and certified to out-perform R-21 insulation for radiant heat gain, so it typically reduces inside temperatures by 17 degrees during 100 F degree days, and can reduce air conditioning costs by up to 40%. Your existing roof is typically not removed for this application, even if your building has two or more layers of existing roofing. Plus, this durable application is considered as ‘maintenance and repair’ by IRS guidelines, so it can be deducted as an expense the year it is paid for!